We’ve all heard and seen the advice given to young (and not so young) job-seekers: “Learn to code – that’s where the jobs are!” Coding (or, to use the more traditional term, “programming”) jobs in particular, and all “IT” jobs in general were supposed to be plentiful and going begging for qualified candidates. Except a funny thing has happened on the way to employment nirvana. 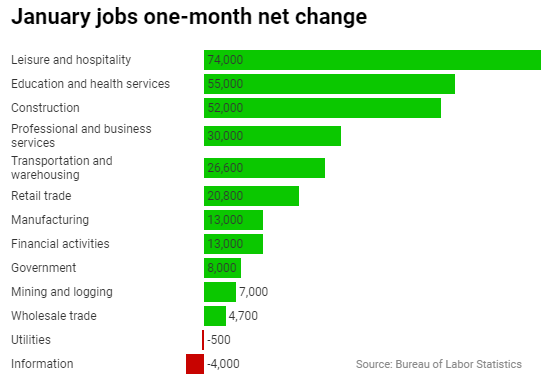 Several months in the last year and now two months in a row, the “Information” industry segment has actually shrunk its employment while nearly all other industries are adding. January’s “blowout” and “beyond all expectations” jobs number had one stinker in it: a loss of 4,000 jobs in the “Information” industry.